For most mothers, pregnancy runs its course without a hitch. However, one of the most devastating complications is if the embryo starts to grow outside the womb - ectopic pregnancy. The condition affects one in every 100 pregnancies. Eggs make their way from the ovaries to the womb through the fallopian tubes, where they may be fertilised by a sperm. The fertilised egg continues on to the womb, where it implants itself to the wall and continues to grow. However, sometimes the embryo implants itself outside the womb, most often in the fallopian tubes themselves, and this is known as an ectopic pregnancy. The embryo can also implant in the ovary, the abdomen, and in the cervix. Anything that obstructs or slows the movement of eggs can increase the risk. Infections in the fallopian tubes can leave them scarred, which will hinder movement, or there may be a physical blockage caused by previous surgery or injury. Hormones - particularly those used in contraceptive pills and devices can also affect the rate of movement of the egg. Women who have been affected by pelvic inflammatory disease or endometriosis are at higher risk. So too are women who have had abdominal surgery, used a coil for contraception, or taken the progestogen-only mini pill, but become pregnant anyway. There may also be an increase among women who take the morning after contraceptive pill to no avail - although this is still unclear. Women who become pregnant despite having been surgically sterilised have a 60% chance of an ectopic pregnancy. And women who have had previous ectopic pregnancy, are at greater risk of repeating the experience. Ectopic pregnancies are on the rise with the rate nearly tripling from 1970 to 1980. About half are estimated to be due to the increase in sexually transmitted infections such as chlamydia. 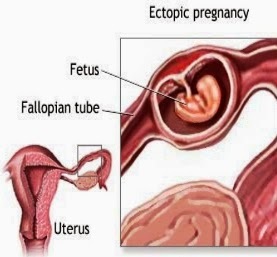 With an ectopic pregnancy, the embryo can rupture the fallopian tube, leading to massive internal bleeding - and possibly death - for the mother, and loss of the baby. If the woman survives this, her fertility is likely to be greatly reduced and her chances of going through the same experience are increased. Because of the life threatening nature of the condition, early diagnosis is essential. If the pregnancy is allowed to continue and the tube ruptures, doctors have to remove it, reducing the woman's fertility. Symptoms of ectopic pregnancy include severe pain low down in the tummy, perhaps on one side only, vaginal bleeding or a watery brown discharge, pain in the shoulders, feeling dizzy or faint and pain when having a bowel movement. If a woman experiences any of these symptoms and thinks she might be pregnant, even if she has not done a test, she should consult her GP or a doctor as a matter of urgency.